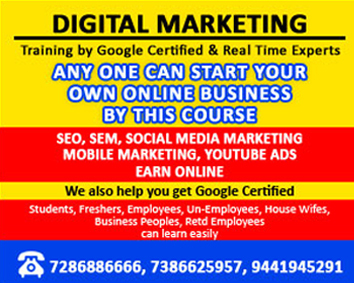 Why should we learn Digital Marketing? Find job opportunities online as Marketing Managers, digital marketing manager, social media and get a salary package ranges from INR 5-20 lakhs per year, based on experience. Show your value to employers: professionals who earn an Digital Marketing certificate have demonstrated that they have the skills valued by many employers hoping to compete in a rapidly changing market. This can be advantageous if you are interested in advancing in your current job. No lectures, only the Industry Leaders: We are not a typical institute, which emphasizes on cramming from books and clearing an examination. Our goal is not to provide any diploma or degree that will be placed on your ornamental shelf for the whole life.The entire purpose behind deliver hands-on learning industrial practice, where industry leaders present their tricks is to make you qualified, competent, qualified and expert in digital Marketing. Kick-start your Career: The world of digital marketing, however, offers a multitude of opportunities for you to start your own career even before setting foot in a workplace. Get paid more than your peers: A recent survey revealed that the prosperity of digital wages grow faster in 2016 than in the previous five years. Moreover, the pace of growth is set to fix.